1. Chop tomatoes coriander and onion together. 2. Squeeze over juice from 1/2 lime, drizzle with extra virgin olive oil. 11. Tortillas: Meanwhile heat fry pan, toast the tortillas one at a time on both sides until charred. Keep warm. 12. Pop 2 tortillas on each plate and top with beans salsa and an egg. 13. Serve with shredded mozzarella, coriander and chilli to taste. 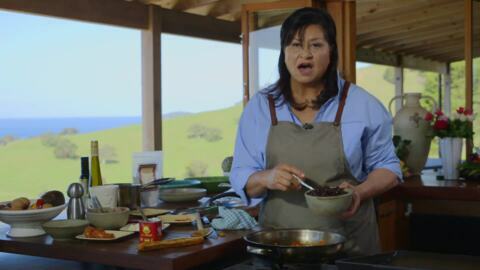 Today, Anne prepares Tina Nicoise, Huevos Rancheros, Eggs done 3 ways and Kawakawa tea.